Posted by kewlhunter in 3D, 3D TV, 3DTV, BD, Bluray, kewl, LED LCD TV, Movies, Online, Shopping Online, Sony, Technology, Television, TV, Video. I have recently started sourcing my Bluray Discs from amazon.co.UK. There are very few outlets for Bluray Discs in Australia(well there are lots but only a few types ie chainstores) and they charge *premium* prices. As the UK are the same Bluray region as Australia, buying from the UK isn’t a problem(The US is a different region and the discs wont play on Aussie players. As far as I know you cannot get any Bluray players that aren’t region locked, but as there are only 3 regions, and the UK is the same as Australia, it does ge us the option of sourcing Discs from there. With the strength of the Australian Dollar, it really does work out a lot cheaper. I buy several titles at once to maximise the benefit of a single shipping charge. I have also organised group buys with my work colleagues and friends. I have found several titles that just aren’t available here and many that haven’t been released yet. I have also found 3D titles which we just can’t buy in Australia. As I have just upgrade to a new Sony 3d TV, this is great. Posted by kewlhunter in 3D, 3D Glasses, 3D TV, 3DTV, cool, gadget, Gaming, Glasses, kewl, LED LCD TV, LED TV, Playstation 3, PS3, tech, Technology, Television, TV, Video. 3D or Not to 3D, is that the Question? Originally I had little to no interest in 3D TVs. I had never got around to seeing a movie at the cinema, in 3D, and so my initial exposure was a very brief demo of an early prototype, and it left me wondering what all the fuss was about. As the demo was trying to show this pre-production prototype 3DTV to as many people as possible, I only got to view about 20 seconds of a 3D game. It suffered from whats known as cross talk(where the stereo images don’t align) making it fuzzy and blurred, and this also diminished the 3D effect. Not a good way to start. Nothing had leaped out of the screen at me, and I walked away thinking *meh* why bother. My next exposure to 3D was on a proper production model, and it was a Revelation. All the crosstalk was gone and the image was razor sharp and in full 3D effect. Now I was thinking maybe there is something to this 3D thing. I think the industry hasn’t done itself any favors, by always having things coming out of the TV (in advertising), when in reality, whats really cool about 3D is how deep into the TV the image goes. Sure you do get some things coming out of the TV screen, but what 3D does really well is the sense of depth you get into the TV screen. 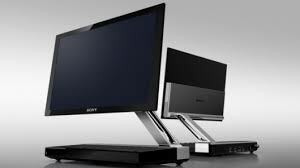 Posted by kewlhunter in cool, kewl, LED TV, Sony, tech, Technology, Television, TV. I recently purchased this amazing little digital TV, and yes it is a small TV, with a screen that is 11.1 inch , butas it is for use on my bedside table, the size isn’t an issue. It is arguably the coolest TV on the planet and is the worlds first OLED TV. This Digital TV uses OLED technology for the display. OLED stands for Organic Light Emitting Diode. OLED screens use organic materials that emit light when an electrical current is passed through them. This has several advantages over the more common LCD panels, most of us have as a TV or computer monitor. LCD screens rely on a backlight to generate the picture. This means the screens are lit from behind and can suffer from light leaking through and so they have trouble displaying a true deep black. OLED screens can turn off individual pixels to produce stunning blacks and brilliant contrast that no other display technology can match. It is also extremely energy efficient. Posted by kewlhunter in cool, kewl, LED LCD TV, LED TV, Samsung, tech, Technology, Television, TV, Video. Posted by kewlhunter in cool, kewl, Television, TV.